Congenital ventricular diverticulum is defined as a protrusion of the free wall of the ventricle, including the endocardium, myocardium, and pericardium., They are frequently associated with other cardiac and midline thoracoabdominal anomalies such as ventricular septal defect, tricuspid atresia, and tetralogy of Fallot. However, isolated left ventricular (LV) diverticulum is found in 30% of cases. We report a 9-month-old infant with congenital LV diverticulum. A well-appearing 9-month-old female infant presented with epigastric pulsations and umbilical hernia. A physical examination revealed a swelling in the umbilical and supraumbilical region. There was a visible pulsation at this region [Video 1 and [Figure 1]. There was no cardiac murmur or arrhythmia. There was no significant antenatal history. Electrocardiogram was normal. Echocardiography showed aneurysmal dilation at the site of LV apex and color Doppler echocardiography revealed a systolic flow from the LV apex to the outside of the LV apical region [Video 2]. There was no additional malformation at echocardiography. Catheter angiography was performed to confirm the diagnosis. 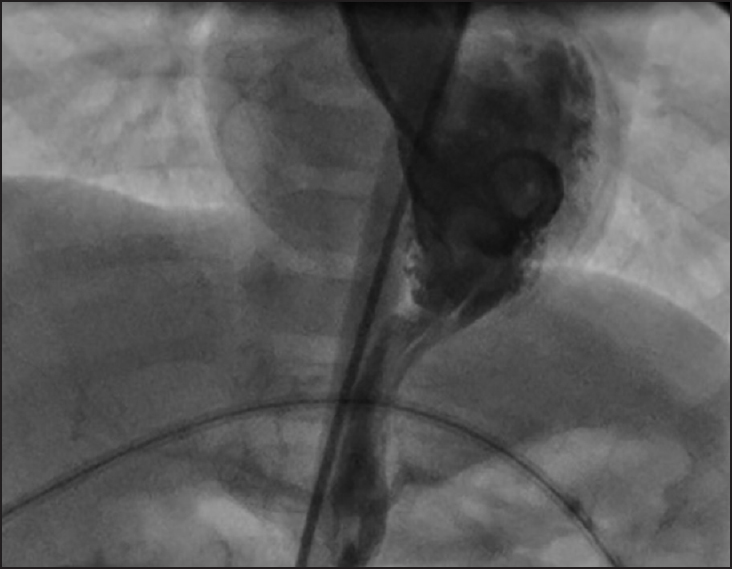 LV angiogram showed an elongated, tubular structure extending from the LV apex downward and anterior to the umbilicus that ended blindly [Video 3 and [Figure 2]. Because the patient was asymptomatic, surgery was not performed. He was started on aspirin at a dosage of 5 mg/kg/day to prevent any thromboembolic situation. Congenital ventricular diverticulum is a rare cardiac anomaly and it has been reported as 0.05% of all congenital heart malformations. It frequently includes other congenital defects involving the abdominal wall, sternum, diaphragm, pericardium, and heart and is called Cantrell's syndrome. Isolated LV diverticulum was reported in 30% of cases. Similarly, our patient had no associated abnormalities and other congenital heart defects were excluded by echocardiography. So, the patient was diagnosed as isolated LV diverticulum. Congenital LV diverticulum can occur in a weak area of the ventricular wall in the first 2 or 3 weeks of embryonic life. Possible etiologies of the LV diverticulum include maldevelopment of the myocardium, intraventricular sinusoids, or viral infections that may result in a localized weakness of the LV wall with gradual protrusion. A diagnosis can be made with echocardiography, computed-tomographic angiography, cardiac magnetic resonance imaging, and catheter angiography. Although, LV apical aneurysmal dilation was seen at echocardiography, catheter angiography was performed to make definite diagnosis in our patient. Cardiac diverticula are often clinically silent but may be associated with systemic embolism, arrhythmias, heart failure, and cardiac rupture. Cases with associated sustained monomorphic ventricular tachycardia have required treatment with an implantable defibrillator or with cryoablative surgery. True incidence of these complications were not known. In a review of 22 patients with congenital ventricular outpouching, ten patients with LV diverticulum were not surgically treated, two experienced spontaneous regression, and eight were alive without symptoms after a mean follow-up period of 8.4 years. According to these findings, in our case, medical follow-up without therapy was preferred, as no arrhythmia was detected and good contractility of the diverticulum was felt to make thrombus formation unlikely. Di Sessa TG, Howard SC, Salim MA. Congenital right ventricular diverticulum associated with a ventricular septal defect: A rare echocardiographic finding. Echocardiography 2006;23:787-9. Shauq A, Agarwal V, Crawley C. Congenital left ventricular diverticulum. Heart Lung Circ2006;15:272-4. Cantrell JR, Haller JA, Ravitch MM. A syndrome of congenital defects involving the abdominal wall, sternum, diaphragm, pericardium, and heart. Surg Gynecol Obstet 1958;107:602-14. Cianciulli TF, Del Carmen Gonzalez Colaso P, Saccheri MC, Lax JA, Redruello HJ, Guerra JE, et al. Left ventricular diverticulum, a rare echocardiographic finding: Two adult patients and review of the literature. Cardiol J2009;16:76-81. Sierra M, Huynh H, Machado C. Congenital ventricular diverticulum presenting as sustained monomorphic ventricular tachycardia. Int J Cardiol 2009;133:e70-2. Marijon E, Ou P, Fermont L, Concordet S, Le Bidois J, Sidi D, et al. Diagnosis and outcome in congenital ventricular diverticulum and aneurysm. J Thorac Cardiovasc Surg 2006;131:433-7.